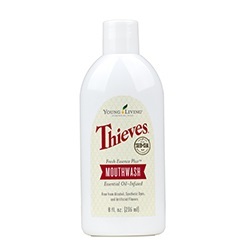 Thieves® Fresh Essence Plus Mouthwash blends Thieves, peppermint, spearmint, and vetiver essential oils for an extra clean mouth and fresh breath. It contains only natural ingredients and uses a patented, time-release technology for lasting freshness. Rinse mount with 1 tablespoon or capful of Fresh Essence Plus for 30-60 seconds or as needed.